Considering the fact that no one knows how the quarterback situation is going to play out in 2015 for the defending Pac-12 champion, Oregon Ducks — it is impressive that Kevin Gemmel of ESPN.com ranked Oregon as fifth in the conference at the position. With match-ups against all four quarterbacks ahead of them, an intriguing battle within arguably the strongest conference in the country will unfold over the course of the upcoming season. Jeff Lockie has made a case for himself this spring. 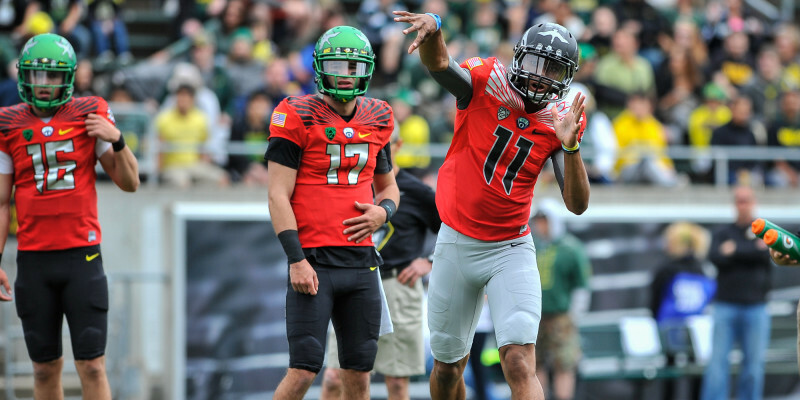 Gemmel acknowledged the difficulty in assessing Oregon’s strength at quarterback. Jeff Lockie does not have much of a track record and, despite Vernon Adams Jr.‘s impressive career at Eastern Washington, his absence from spring practices diluted his chemistry with the coaches, as well as his new teammates. The Pac-12 appear to have no intentions of slowing down in their race to show the country that they are challenging the SEC for the hearts and minds of college football fans and analysts. At quarterback, USC’s Cody Kessler narrowly won Gemmel’s top pick over Cal’s Jared Goff. Kessler posted 3,826 passing yards and 59-12 TD-to-INT ratio for his career — only Goff has more career passing yards at 7,481. The Ducks and Trojans have not faced off since 2012 — a year before Kessler took the reins in SoCal. The highly anticipated bout on Nov. 21 will pit the senior from Bakersfield, Calif., against the new QB of a Ducks offense hungry to prove they are more than a product of a single star. Marcus Mariota and Goff went toe-to-toe last season at Levi’s Stadium in a high-scoring affair that featured both quarterbacks throwing for more than 320 yards and amassing 7 passing touchdowns between them. Lockie’s only experience against Cal was in 2013 — which was a single pass for 3 yards in a 55-16 blowout. The Golden Bears will return to Autzen Stadium on Nov. 7 in search of their first victory against the Ducks since 2008. Job security, lack of a complete track record for Lockie and questions about how well Adams’s skills will transfer to the FBS level all appear to have factored in to the boost of Arizona State’s Mike Berovici and Stanford’s Kevin Hogan ahead of any Duck hopefuls. Thomas Tyner is back and could overtake Royce Freeman as the lead back in 2015. One thing is certain, the talent surrounding these two can only help their cause. A strong running game with the two-headed monster of Royce Freeman and Thomas Tyner at running back will alleviate some of the pressure from Adams — should he prove his mettle and snag the job from Lockie this summer. With the running game established, it shouldn’t be hard for either QBs to pass at will to returning receivers — Bralon Addison, Devon Allen — both coming off injury — and potential super star, Alex Ofodile. 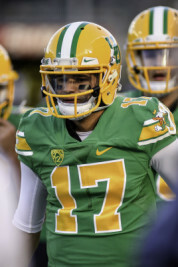 It’s hard to imagine that Oregon signed Adams without intending to use his athleticism to fill the void left by Mariota, but Lockie did his best this spring to establish himself as more than Mariota’s understudy. Working with one of the best college football players in history will sharpen your skills; so the battle will only intensify when Adams arrive next month — then the competition can truly begin! Alex OfodileCody KesslerESPNjared goffJeff Lockiekevin gemmelMarcus MariotaRoyce FreemanThomas TynerVernon Adams Jr.